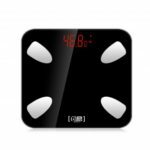 This Body Fat Scale features 4 high-precision pressure sensors, quickly and accurately measures body weight, body water, body fat, BMI, muscle mass, bone mass, etc. 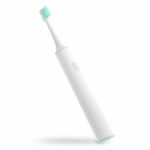 It provides 17 physical data analysis, which is perfect for people looking to take control of their health. 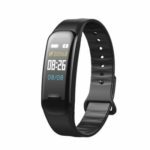 With Bluetooth 4.0 technology, you can connect with the corresponding APP and it will give you the professional fitness scheme, diet plan according to your health condition and your goal. Collecting 17 physical indexes: body weight, BMI, visceral fat, muscle mass, bone mass, body water, body fat, body age, protein, basal metabolism rate, fat weight, BFMI, body form, obesity level, fat-free body weight, normal weight, body score. 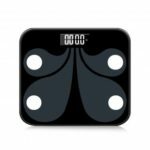 Utilizing the latest BIA technology, the electric current is sent through the body via the scale sensors to accurately estimate your body&apos;s stats. Equipped with 4 high precision sensors to ensure that you quickly get accurate all body composition metrics. 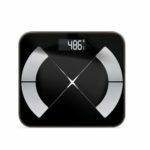 It creates an elegant and harmonious appearance with appropriate clear reading only when you step on the scale would the data be displayed. Using Bluetooth 4.0 technology, this body fat scale seamlessly uploads the measurements to the corresponding APP. The APP will give you the professional fitness scheme, diet plan according to your health condition and your goal.